Established in 1990, Wyoming Romagnolas is owned and operated by Ron, Diane and James Pullen from their Queensland based properties “Mira” at Rolleston and “Tedlands” at Koumala. Mira is a 15,800ac property located 42kms from the township of Rolleston in Central Queensland while Tedlands is a 8,700ac property located 5kms from the township of Koumala on the Queensland coast just south of the regional centre of Mackay. Both properties are fully developed cattle enterprises running approximately 5,500 head of cattle between them, including 450 head of purebred Romagnolas, of which approximately 150 are registered. Today Wyoming Romagnolas are recognised as having one of Australia’s largest Romagnola herds with an excellent line of registered fullblood Romagnolas and a much larger herd of unregistered upgraded Romagnolas derived from a diverse range of quality genetics. 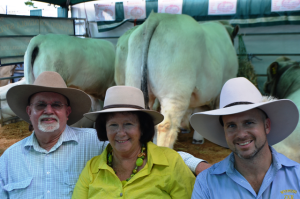 Our operation has a strong commercial focus with the Romagnola used as the sole breed in our crossbreeding program over our high content Brahman herd. In recent years we have also commenced crossing breeding some of our purebred Romagnola females with Angus bulls. Both crossbreeding programs have proven to be winning combinations. Our bulls are available for sale at shows, field days and from the paddock all year round and are selected on a strict criteria including structural soundness, growth for age, fertility and temperament.